This is a great question, and one I've been asking myself lately WRT the Paseo. Now, the Paseo's spoiler doesn't look like much. There is barely a gap between the trunk and the bottom of the spoiler (less than an inch). This leads me to believe it may help with aero. Sorry but I can't see it helping by adding another planar surface for the air to flow past, although I really doubt it hurts much. Something you might want to try would be to tape some chloroplast from near the bottom of the rear window molding across the top of the spoiler to effectively raise the height of the rear deck. 2) It's deep enough in the front-to-rear direction that it could permit better flow reattachment coming off the roof if it has separated. If you've got attached flow at the trailing edge, you minimize rear wake. Now the goal of this piece of work was solely to increase downforce (which in this car's case also increased drag). But what makes it similar to the Paseo's is that if the trailing end of the vehicle is below separated flow, it's useless. By raising the height of that end surface to get reattached flow, you can take advantage of it - to either achieve cleaner separation, which we want, or to generate downforce. Disclaimer: I'm no expert. I'm just spouting my interpretation of the Paseo based on things I've read. Another very interesting article...thanks MetroMPG! Not that it makes much difference to the author's points...but he uses the term "laminar" when he simply means "attached". There is very little laminar flow on any car, because any irregularity bigger than a couple of hundredths of an inch will trip the flow. The flow may still be attached, but it is now turbulent. Any body parting line (hood, ornaments, bug splatters, paint chips, trim, doors, etc.) will trip the flow. And there isn't a lot of drag difference between laminar and mildly turbulent flow, either, so long as the flow remains attached. Other than that relatively minor point, good article! where did you get that photo of the blue Nissan with the plywood skirts and rear wing? I ran a business as a fiberglass body kit builder in the late 80's. I made molds from this mockup. Unfortunately not too many Sentra owners were buying, so I had to close up shop. 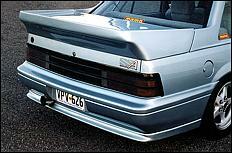 I actually set out searching for a photo I'd seen before of a wood wing on the back of an 80's Caprice. Didn't find it - but this one works. I feel like most contemporary spoilers are simply for styling. "The Fast and The Furious"inoculated the public mind with the notion that the spoilers portrayed in the movie were the hot-ticket for any performance-minded street-racer.Those spoilers would begin to produce measurable downforce at 120-mph,below that velocity,they're virtually useless.Since they are intended for downforce,by default,they increase drag. In the 1970s,when rear spoilers began to show up,they were a paliative for poorly designed cars.Modern day cars would have no need for a spoiler,as,simply raising the height of the trunklid accomplishes the same thing, while adding useful trunkspace. If your curious,a rule of thumb would be to measure the angle of incline from the back edge of the roof,to the rear top edge of the trunklid,as measured from the horizon.If that angle is greater than about 12-13-degrees,you'll have flow separation and high drag.If the angle is 12-13-degrees,flow will be re-attached at the trunklid,with a captured vortex spinning within that defined space,a smaller wake,and lower drag. For a notchback car,the patented Ford Bi-wing spoiler,as used for the Sierra concept car/ Merkur XR4Ti of the 1980s offers the best drag reduction for anything cooked up that I know about. An angled aluminum plate as created by CAR and DRIVER for their Crisis-Fighter Pinto project for 1974,made a very productive rear spoiler,projecting up at no more than a 30-degree angle to a line which intersects an imaginary 12-13-degree line measured down and back from the roof.P.S.,the "tunnel" style,hollow type spoilers need to be "deep",projecting as close to the rear windshield as possible. They are for salt-flat speed records. I don't *think* they are for downforce. Aesthetically, I think they are "as cool" as the raised spoilers. I'll bet they are less practical in parking lots because they extend the length of the car and are therefore vulnerable to damage. Hmmmm. In the "grey primer" image, there is a parachute tucked in the back. Maybe they're main purpose is to act as parachute shields?!?!?!?!? I wonder... The Cobalt one has struts where the parachute would be. is the reason some wagons have a spoiler is to extent the roof-line to make it slope more downward before the air separates from the car, kinda like on a caliber? I just wanted to hear what you guys think of the stock spoiler on my 96 saturn. This is not my car, but i have the exact same spoiler. Looks fairly pointless to me. Exactly. Speaking only of roof extensions on hatchbacks/wagons: if the extension slopes slightly downward, it's a safe bet that it's an aerodynamic benefit. If it slopes upward relative to the roofline, it's Fast & Furious.